Japanese grocery stores had a problem. They are much smaller than their U.S. counterparts and therefore don’t have room to waste. Watermelons, big and round, wasted a lot of space. Most people would simply tell the grocery stores that watermelons grow round and there is nothing that can be done about it. That is how the vast majority of people would respond. But some Japanese farmers took a different approach. If the supermarkets wanted a square watermelon, they asked themselves, “How can we provide one?” It wasn’t long before they invented the square watermelon. The solution to the problem of round watermelons wasn’t nearly as difficult to solve for those who didn’t assume the problem was impossible to begin with and simply asked how it could be done. It turns out that all you need to do is place them into a square box when they are growing and the watermelon will take on the shape of the box. This made the grocery stores happy and had the added benefit that it was much easier and cost effective to ship the watermelons. Consumers also loved them because they took less space in their refrigerators which are much smaller than those in the US meaning that the growers could charge a premium price for them. The major problem was that most people had always seen round watermelons so they automatically assumed that square watermelons were impossible before even thinking about the question. Things that you have been doing a certain way your entire life have taken on the aura of the round watermelon and you likely don’t even take the time to consider if there is another way to do it. Breaking yourself from assuming this way can greatly improve your overall life as you are constantly looking for new and better ways to do things. The best way to tackle these assumptions is to question your habits. If you can make an effort to question the way you do things on a consistent basis, you will find that you can continually improve the way that you live your life. Forming habits when they have been well thought out is usually a positive thing, but most of us have adopted our habits from various people and places without even thinking about them. It’s a never ending process, but by doing this, you can consistently strive toward making all aspects of your life more enjoyable instead of defaulting to what you have now. When faced with a problem, be creative in looking for a solution. This often requires thinking outside the box. Most people who viewed this question likely thought they were being asked how they could genetically alter water melons to grow square which would be a much more difficult process to accomplish. By looking at the question from an alternative perspective, however, the solution was quite simple. Being creative and looking at things in different ways in all portions of your live will help you find solutions to many problems where others can’t see them. 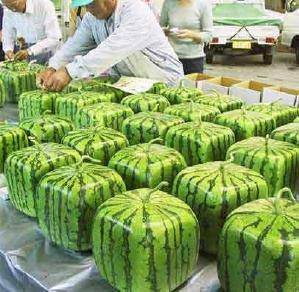 The square watermelon question was simply seeking a better and more convenient way to do something. The stores had flagged a problem they were having and asked if a solution was possible. It’s impossible to find a better way if you are never asking the question in the first place. Get into the habit of asking yourself, “Is there a better way I could be doing this?” and you will find there often is. Impossibilities often aren’t. If you begin with the notion that something is impossible, then it obviously will be for you. If, on the other hand, you decide to see if something is possible or not, you will find out through trial and error. Take away the lessons from the square watermelons and apply them to all areas in your life (work, finances, relationships, etc) and you will find that by consistently applying them, you will constantly be improving all aspects of your life. Unless you are the very first technical writer at a new company, and are starting from a blank slate, you’ve inherited a documentation set that represents the sum total of all the habits and choices that preceded you. Some of these may have been good, but others may have been quite dreadful. They can range from having engineers pretending to be technical writers, to not having writers review each other’s work. Your job is to continually have a fresh set of eyes and question everything, including the way you’ve done things. This can be challenging, but all rewarding things in life are. This ties in all the previous points. If you assume nothing, question previous habits, and are creative, the result will be that you found a better way to create the documentation, and in doing so improved the quality of it.